In the past, outdoor spaces were largely ignored by builders. Patios were either basic wood structures or plain concrete slabs. However, modern homeowners are looking for something more. People are moving out of the living room and into the back yard, so they’re in search of homes with stunning outdoor living areas. This includes patios that are large enough for a swing or glider. It extends to back yards where people can relax and unwind after a long day. Gardens that feature landscaping are more appealing to potential buyers. When you’re trying to make your mark as a contractor, you must be prepared to meet these expectations with your own beautiful outdoor spaces. Damp areas are slick, but you can make them safer by using textured stones, or if you’re adding a water feature to your new model home, then finish off the surrounding walkways with beautiful shell reef limestone. Suitable for interior and exterior uses, it can be used to add visual interest and appeal to the project. It is a softer stone, so the finish and color will shift slightly over time. However, this can be part of the appeal of the durable and attractive stone. Coral stone has fossilized patterns trapped in the stone, and it lends a certain mystique to any area. A beautiful choice with a cream background and shades of red, gold, and white strewn throughout, it’s a fine choice for upscale hospitality projects as well as casual homes. Outdoor kitchens are in demand among discriminating buyers, and you’re sure to please your clients by adding one to your next custom patio. When it comes to the flooring, go with coral stone tile for traction, style, and class. It will be the perfect finishing touch in any kitchen, and it will boost the value of the property. 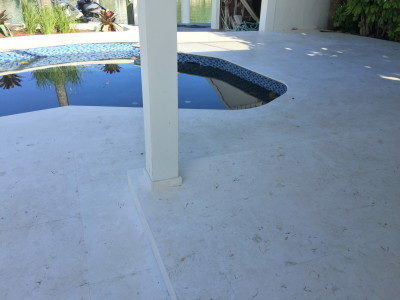 Travertine is a durable stone that can handle temperature changes as well as water. You can make any patio stand out by using this interior stone on the exterior finish. Travertine has a stunning beige background that’s highlighted with shades of red, tan, and gold. It has a distinctly Mediterranean feel, and is perfect for everything from a Florida lanai to a front porch in Minnesota. The tiles can handle a wide range of weather conditions, so you can trust that they’ll last for years. Tiles have been used on indoor fireplaces for centuries, but outdoor structures still rely heavily on rough stones. You can embrace an emerging trend by finishing off the outdoor fireplace surround with natural stone tiles. Whether you go with deep Black Basalt Stones or Fantasy Blue Limestone, you can add a decorative touch to the fireplace by going with natural stone. As with an indoor fireplace, the key is to use an appropriate liner that will handle the heat. You can even extend the tiles along horizontal lines by using them to finish benches along either side of the fireplace or right in front of them. Concrete porches are the standard choice in most subdivisions, but you can make your custom homes stand out with elegant tile porches. You can use almost any natural stone, including Crema Bella marble, Rojo Alicante tiles, or even Emperador Brown dark marble tiles. You’ll set the tone for everything that’s waiting inside, and you’ll make an incredible first impression on potential buyers. Wood pillars will look great with the stone tiles, and you may want to elevate this upscale finish by adding the tiles to a bench or shelf. Finished marble tiles also look great with raw stones pillars or siding. It’s easy to clean, and it’s an upscale addition to any home. Landscapers can also make use of natural stones. Planning out a beautiful arrangement of plants is only the beginning. You also may need to add walkways so that people can navigate the garden with ease. Marble and travertine are ideally suited to outdoor applications, including installation in garden areas. They can handle the moisture and sun exposure. They’ll add a natural touch of color to the garden, and the texture is sure to please your clients. Whether you go with a row of stepping stones or a wider walkway, you’ll create a unique look that’s perfect for resorts, high-end homes, and casual properties out in the country. If you’re worried that natural stone tiles will be slick when it rains, you’ll appreciate knowing that there are easy ways to improve the traction on patios and porches. Most natural stones have a certain amount of grip that makes them ideal for areas that will get wet. Additionally, you can also go with smaller stones to increase the grout lines. This creates more traction while adding to the visual appeal. You can also finish off the stones with a special sealer. The anti-slip solution will provide your clients with improved traction while maintaining the attractive look of the natural stones. Stock up on natural stone tiles that you can use on all types of projects. Whether you specialize in large commercial structures or smaller residential jobs, your clients will appreciate your use of high-end materials. Appropriate for outdoor spaces, they can be used throughout the property from the front porch to the garden pathway. We offer bulk pricing to help you keep costs down and improve your profit margin, so call Nalboor Tiles today at 305-501-4548. We’re looking forward to helping you with all types of orders. You can also submit an online request for more information.